When Simon, an orphaned young cat, is smuggled on board HMS Amethyst, his simple life amidst the streets of Hong Kong is transformed into an adventure fit for heroes. Bringing joy and compassion to those on board, Simon is the only cat to have been awarded the PDSA Dickin Medal, the highest honour for animal gallantry in wartime. Based on the true events of Amethyst’s ‘Yangtze Incident’, Able Seacat Simon’s quirky yet emotional cat’s eye narrative is sure to move and entertain all who read it. Able Seacat Simon’s tale is a purrfect read for fans of A Street Cat Named Bob, Solomon’s Tale, and Alfie the Doorstep Cat. Jacky Donovan might not have nine lives, but she does have a few. Bored with being a ‘Stepford’ housewife in Southampton, Jacky packed her bags and headed to London just over a decade ago. She’s now an established author and, more importantly, curious about cats. 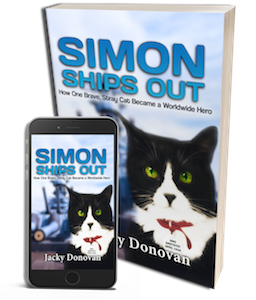 Her latest book Simon Ships Out: How one brave, stray cat became a worldwide hero – the memoir of the world’s first celebrity cat! – has been published to great acclaim in the UK. She is a regular contributor to Huffington Post and Sabotage Times. In between her writing she has recently trekked to see Mount Everest; tandem jumped from a tiny plane; been on Canarian TV due to her crazy long fingernails; run a lesbian dining club; escaped from a yoga holiday in a dinghy; and regularly does charity work for Breast Cancer and Gay Pride. She currently spends her time between London and Gran Canaria.